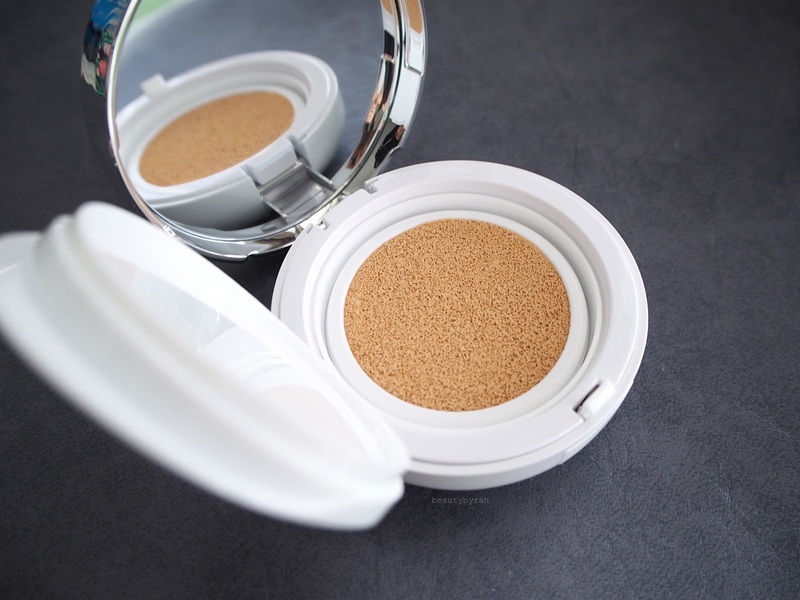 Being on the BB/CC cushion roll, I am back with a review on The Face Shop CC Intense Cover Cushion. 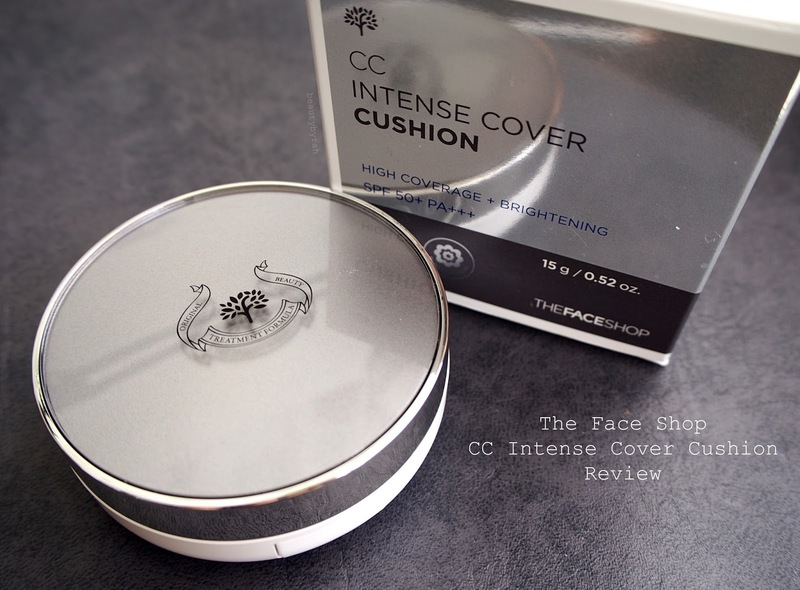 This CC Intense Cover Cushion is excellent for those who want perfect, flawless skin without flakiness or clumping. This CC Cushion is clinically proven for 25 hour-lasting moisture and coverage effects. It provides strong coverage with great abilities to hide blemishes and greatly adheres to the skin without the feeling of heaviness. Like always, let's start with the packaging first. It comes in the typical circular pact with the cushion, sponge applicator, mirror and plastic flip cover to prevent the product from drying out. It looks really simple yet classy due to its slightly reflective grey lid. It feels sturdy and travel-friendly too. I got mine in the shade Natural Beige V203 (the darkest of the range - they also have Pure Beige (V103) and Apricot Beige (V201) available). This is still a tad light for my NC20-25 skin so I do feel the need to bronze up my complexion in order to match the rest of my body and my neck. Like many other korean makeup brands, the shade range isn't fantastic and does not cater to the darker complexions. Upon application, I was extremely pleased with its coverage. This is probably the highest coverage I've encountered with BB/CC Cushions! One dip into the product could fully cover half of my face - really impressive - and I do not feel the urge to layer the product in order to cover my acne scars as they were pretty much covered. I would say the coverage is medium upon application and can be built to medium-full if required. This really did blow my assumptions that BB/CC Cushions always have light coverage! In terms of formulation, I gotta say that is it hydrating. My skin does not feel uncomfortable in any way and my dry patches were not emphasised throughout the day. However, it could be due to this hydrating factor that results in the product not setting on the skin. This results in slight difficulties in blending the product in as well as the product just keeps moving around without setting. 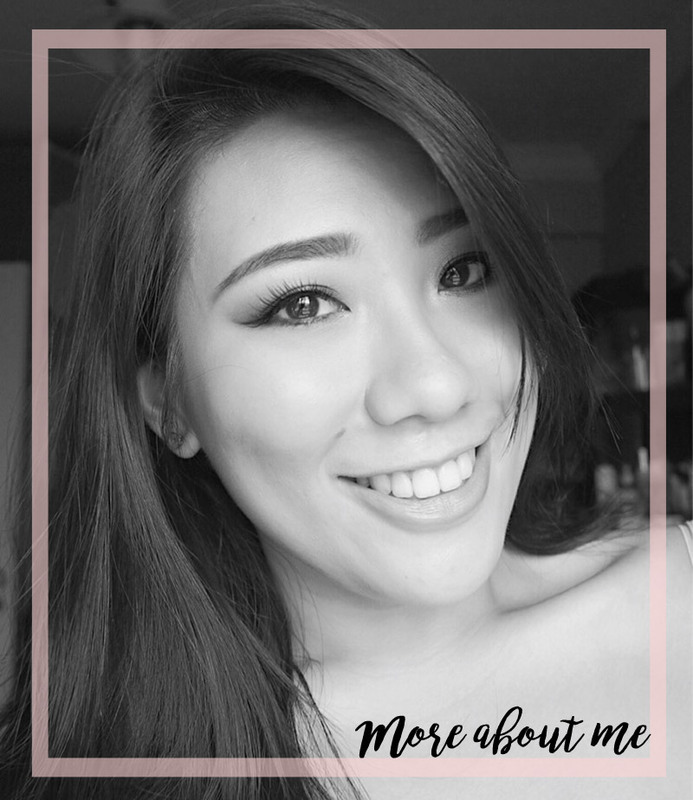 I usually apply my base makeup before moving onto the eyes, and then finally setting the entire face with powder and complexion products. I realised that the product remained tacky on my skin even after my eyes and brows were done and that it failed to set. Thus, streaks and patches were formed as any slight contact with the face would result in the product moving and transferring. To fix this, I simply use a foundation brush to buff in the product and remove any streaks before setting it with powder. Not to big a deal, but good to note! So after trying out various methods, I highly suggest you set the product with powder before moving on to any steps of your makeup routine. Also, please do remember to set as this product does require something to make it adhere to the skin without budging! A little bit does go a long way so refrain from dipping back into the product numerous times as that could result in excessive product on the skin and since it does not set, that might be an issue! I wore this out for my long day at work (I was out 12 hours, imagine the toll on the makeup. And the soul.) and I'm glad to report back that is lasting power is decent. I did not notice any patchiness at the end of the day and coverage was still provided (about 80% as compared to freshly applied). I did notice that the product on my upper lip and tip of the nose was gone, but that is nothing unexpected. 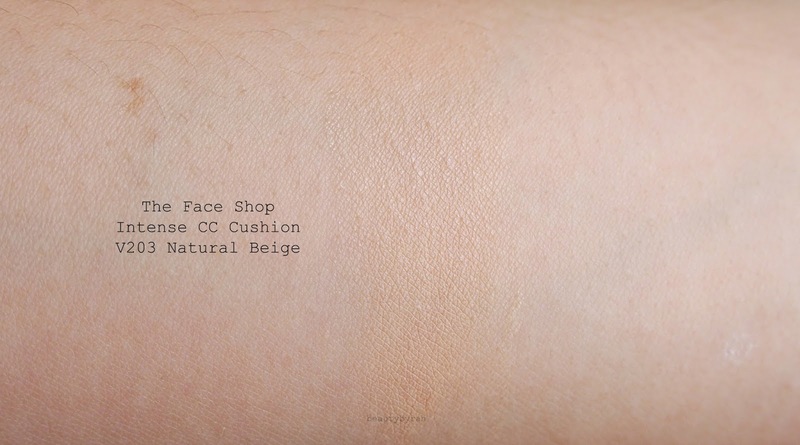 For a CC cushion, this had good lasting power. Overall, I do like how hydrating this product is as it really does help when you are in an air conditioned workplace everyday. The coverage is fantastic too! However, I am not a fan of the formulation as the product just kind of sits on my skin, without setting. 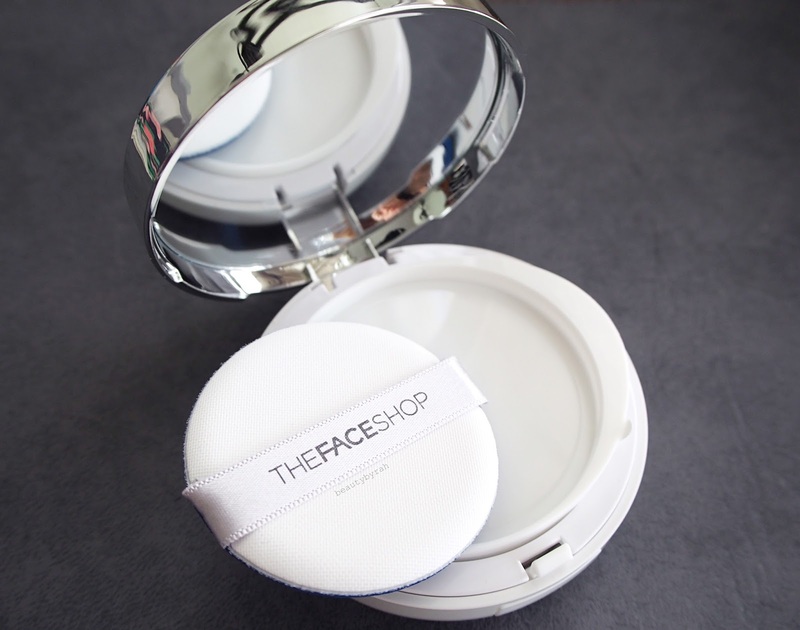 This retails for SGD$19.90 at any The Face Shop outlets. Hope this review was helpful and thank you for dropping by! Xo.